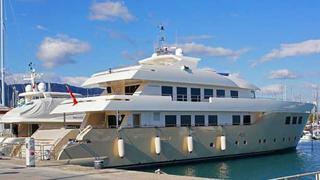 Egon Faiss at Ned Ship Group sends news of a €800,000 reduction on the 41.3m motor yacht BaiaMare. She was built in 2011 in epoxy composite, reinforced with carbon, with an efficient and economical hull design that is not only stable but also capable of cruising and anchoring in shallow waters thanks to its tunnel propulsion system. The voluminous interior is laid out with an upper-deck master suite, a VIP suite on the main deck and four double guest cabins on the lower deck. While the owner’s suite has its own terrace on the upper aft deck, guests can enjoy an alfresco lifestyle on the sun deck, hosting a spa pool, bar and seating area. The twin screw yacht is powered by twin MTU 12V 2000 M94 diesels, which give her a top speed just shy of 19 knots and an economical cruising speed of 15 knots. Her range at cruise is more than 2,000 nautical miles. Lying in Turkey, BaiaMare is now down from €11.7 million to €10.9 million.